This breed features a medium-length woolly, blue-toned fur with a dense undercoat that feels like sheep’s wool. The blue coat is similar to the Russian Blue. The Chartreux is noted for its round-shape head that bears a Mona Lisa smile and soulful eyes that are gold or copper colored. Weekly brushing is a must and increase to two to three times a week during the spring and fall shedding seasons. Females weigh between 6 and 9 pounds and males average between 10 and 14 pounds. The ever-pleasing, comical Chartreux never turns down an invitation to play fetch or learn dog-like tricks. This hardy-sized cat is a gentle giant who speaks in a soft mew to communicate with you. Some seem like mutes – except for their steady purrs. This breed is at ease around children, other cats and dogs. This is also a cat who tolerates travel well and is well-mannered. 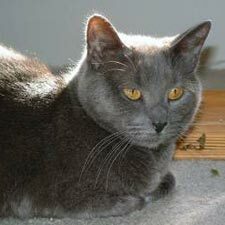 The Chartreux is regarded for its mousing skills and prefers to play in short bursts and then take a cat nap. Definitely a cat who likes set daily routines. This breed tends to like everyone, but be particularly bonded with one person in the home and show that love and devotion by giving that person gentle head butts. The Chartreux welcomes affection, but prefers to be a “four on the floor” cat (all four feet on the ground) rather than being picked up and placed in your lap. This cat is very sensitive and responds better to positive reinforcement than scolding or physical punishment. The Chartreux is genetically prone to patellar luxation and hip dysplasia. Some speculated that the Chartreux breed originated in the 13th century as a mountain cat in what is now Syria. Historic records indicate that some Crusaders brought these cats back to France and left the fighting to join the Carthusian monastic order. The breed was a favorite feline of Carthusian monks of France and an admired mouser. Some claim that the breed got its name after the world-famous Chartreuse liquors made by these monks. This breed nearly became extinct between World War I and II, but devoted European breeders worked together. The first of this breed came to the United States in 1971. American breeders have worked hard to improve this breed and the North American Chartreux bloodline is now regarded as the purest in the world. Today, the Chartreux is ranked 26th in popularity among the breeds listed by the Cat Fanciers Association, which granted it championship status in 1987.